Hypertension is a chronic medical condition in which the blood pressure in the arteries is persistently elevated. 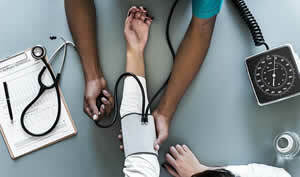 Hypertension is also sometimes called high blood pressure. High blood pressure usually does not cause symptoms. Long-term high blood pressure, however, is a major risk factor for many illnesses such as coronary artery disease, stroke, heart failure, atrial fibrillation, peripheral vascular disease, vision loss, chronic kidney disease, and dementia. According to statistics, about 90–95% of cases are primary hypertension. This type is defined as high blood pressure due to nonspecific lifestyle and genetic factors. Lifestyle factors that increase the risk include excess salt in the diet, excess body weight, smoking, and alcohol use. The remaining 5–10% of cases are categorized as secondary high blood pressure. This type of hypertension is defined as high blood pressure due to an identifiable cause, such as chronic kidney disease, narrowing of the kidney arteries, an endocrine disorder, or the use of birth control pills. Blood pressure is expressed by two measurements, the systolic and diastolic pressures, which are the maximum and minimum pressures, respectively. For most adults, normal blood pressure at rest is within the range of 100–130 millimeters mercury (mmHg) systolic and 60–80 mmHg diastolic. For most adults, high blood pressure is present when the resting blood pressure is persistently at or above 130/90 or 140/90 mmHg. Different numbers apply to children. High arterial blood pressure affects between 16 and 37% of the population globally. In 2010 hypertension was believed to have been a factor in 18% of all deaths (9.4 million globally). Lifestyle changes and medications can lower blood pressure and decrease the risk of health complications. Lifestyle changes include weight loss, decreased salt intake, physical exercise, and a healthy diet. If lifestyle changes are not sufficient then blood pressure medications are used. Up to three medications can control blood pressure in 90% of people. The treatment of moderately high arterial blood pressure with medications is associated with an improved life expectancy. Hypertension can be a long-term medical condition. The causes of secondary high blood pressure cannot be identified. Changes in eating habits can lower high blood pressure.